The recent acts of injustice suffered by both black men and woman have sparked both outrage and ignorance in the black community. One of the consistent ignorant comments that emerge during discussions of white inflicted violence on the black community, is the presence of black on black crime. Black on black crime is a construction by those of the majority as a means of disassociating western influence on black bodies.It was western influence that taught blacks to hate the color of their own skin, to bow down to a master rather than assume their position of majesty. It was western influence that taught blacks to hate the coiled texture of their own hair. It was western influence that taught blacks to hate their curvaceous physique and the fullness of their lips. Perhaps most significantly it is western influence that constructed “blackness“ as the binary opposite to the self proclaimed superiority of whites. As mentioned in a previous post, violence, be it verbal or physical, operates under power. However due to equitable differences between black and whites, each experience a vastly different relationship to power. Violence is a tool by which blacks access power, and power unlike people, knows no prejudice. Thus where there has been power there has been corruption. Even in the terrain of the motherland there was corruption. However, the subjugation of blacks by other blacks was operative under a vastly different system than the subjugation of blacks by whites. Foucault’s discussion of the Panopticon in his work Discipline and Punish, analyzes the implementation of power in surveillance. The architecture of the panopticon places the surveyor in a tower that allows him to monitor the surveyed’s every move. The surveyed internalizes this surveillance and in turn becomes his own surveyor. Foucault’s theory bears an unsuspecting parallel to the dynamics of black on black crime. Black on black crime is a manifestation of the same power dynamic in which the oppressed internalizes oppression to such an extent that he becomes his own oppressor. Thus, black on black crime is the result of internalized racism, in which blacks are a manifestation of white destiny paved over black subjugation. Acting as though whites inflicting violence onto black bodies are in smaller quantities than blacks on blacks manipulates the mindsets of the world in favor of the majority. Amidst the fallacy of black danger, white violence on black bodies is deemed self defense. The phrase black on black crime masks white responsibility with a presumed fault in blackness. The deflection of responsibility onto black bodies is nothing new to the black diaspora, as perhaps the most unsettling aspect of violence on the black community is the failure of whites to assume any responsibility. Because if blacks are in fact their own worst enemies, it is because blackness* was created in the image of its westernized oppressor. *for clarity purposes, the use of blackness in this context is as a western induced construct- not to suggest that europeans bred blackness, but did construct how we have come to conceptualize blackness. Isn’t it possible that some people just have a tendency to be angry and violent, regardless of ethnicity? Why does the cause have to be internalized oppression by the “majority race” ? Thank you so much for visiting my blog. While I appreciate your comments, I find it very contradictory that your previous comment criticized “my” categorizing of people by race, and this comment features you categorizing your friends i.e. : “black friends” and yourself i.e. : “Arab American.” Also keep in mind that these categories of race and ethnicity are featured on the census and countless other sources, so to say that I am in fact factoring people is tad overzealous. I challenge you to consider what is it about my articulation of the struggles within the black community that truly make you uncomfortable? Also, I’d like to state that your conceptualizing of racism (considering how it was used in your comment) demonstrates a misunderstanding of what racism truly is. I encourage you to consult my post “The Equity of Equality: Why Blacks Can’t be Racist” or the works of Dr. Beverly Tatum. Cheers. * It’s also interesting that you felt it necessary to disassociate yourself from whites, as if Arabs didn’t enslave Africans prior to the first European ship’s arrival. 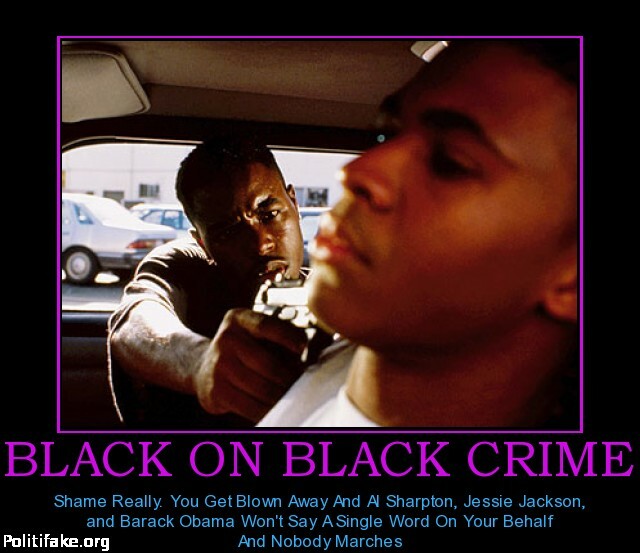 Black on black crime is the what happens when blacks kill other blacks. It’s not because of racism, slavery, or the white race. It’s because of niggerism. Ignorant, trifling, not-wrapped-too-tight black savage niggers are out of control and a danger to society. Don’t know if you’ve realized it or not, but black males are the most dangerous males on the planet! Blacks are 13% of the population yet commit more crime than any other race. It’s no surprise prisons are filled to the rim with black males as it should be. More prisons MUST be built simply because black males insist on continuing their crime sprees. And they don’t stop.